The little contact I had with the team was great. Everyone was so nice and they were even able to accommodate an early check in! This is one of the best stays we have had in the mountains. We love the cabin, very clean and tidy. A beautiful view on a beautiful mountain. We really enjoyed exploring the Deep Creek Area and we hiked part of the Appalachian Trial. It was so beautiful. Thank you for sharing your beautiful cabin with us. We loved it. Beautiful cabin. It is so peaceful and quiet. We had a great time while here. We loved watching the thunderstorm out the beautiful windows. The sunrise was amazing the next morning. I was so pleased with the cabin and the mountain setting. We celebrated our 5th wedding anniversary here and we thoroughly enjoyed ourself. We hope to bring our family back with us next time we come to visit. First Family vacation adn we had a great time!!! Can't wait to come back. This was by far the best vacation. 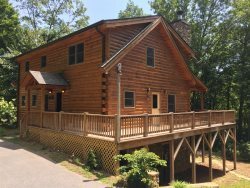 You cannot beat the view (especially the sunrise on the front porch) or just the overall relaxation this cabin gives you. We were here for 3 nights 4 days--we went out to the casino for one night (which was unforgettable & fun) and the other we put steaks on the grill and enjoyed the hot tub. I highly recommend the bear hug cabin--you will NOT be disappointed & it will exceed your expectations! The pictures are all true and actually better in person. Very clean cabin! I definitely cannot wait to come back! What a wonderful weekend away from the bustle of Charlotte, NC. We thoroughly enjoyed the welcoming cabin. This is by far the nicest cabin either of us have been blessed to call home even for just 2 days in our lives. We will never forget the experience, nor how majestic the stars twinkled from the hot tub in the sky! Thank you again. this is our first stay here. What a beautiful cabin! We really enjoyed the fireplace. Our trip was prompted by my husband's softball tournament. It turned into a much more relaxing getaway than we expected and definitely needed. Thank you for being pet friendly, we will be back again. This was our first getaway cabin experience and it was absolutely perfect!! The cabin is so precious and the views!!! We will definitely be coming back again! Thanks for letting us use this adorable cabin for a weekend! The cabin was cozy and perfect for a Spring Break. Thank you for letting us stay in your cabin. An amazing vacation away from south Georgia. This cabin was breathtaking! The view, the hot tub and just the relaxation it gives you. Cannot ask for better!! As much as we enjoyed the town and shopping - grilling a couple of steaks, warming up in the hot tub to unwind and watching the sun come up over the mountains is what we enjoyed the most. We will definitely come back soon. My husband and I came up for a couples get away and the cabin was more than we could have asked for. The cabin is beautiful!!! The town is amazing, the hot tub was great. We will be back! Thank you for having such a nice, clean and beautiful place to come to. The sunrise on the mountains off the back porch is a must. Thank you for making room for me at one of your cabins last weekend. It was a delightful little place and I thoroughly enjoyed my visit to Bryson City, seeing an old classmate and his family. The cabin was neat, clean and in good order. All of the folks I spoke with and emailed with were helpful and kind and I truly appreciated that. The cabin was awesome, the layout was incredible, and the space was impressive! The cabin fit our needs perfectly and we are already planning another trip for next year! We had a wonderful family vacation! Beautiful views with a couple of days of snow. Can't wait to return. Loved it here. Great Scenery and cozy cabin. Love Country Living. Enjoy the view, its truly amazing, go for walks or hike around the area. Just take it all in. If you've never been to the smokies this place will pull you in and captivate your mind. The most beautiful cabin/location we have been to in the south east. Truly amazing. The cabin was very nice, clean, and well maintained. Just sit on the porch and watch nature's TV, we were all amazed. Kelli was extremely nice and very helpful with my questions , she took very good care of us. We will be back next year, hopefully sooner in the winter with possible snow. The first night we were snowed in, but being in such an awesome cabin we still had loads of fin. Me, my family, my friends and my dog Duke made lots of memories here that will last a lifetime. Thank you so much.